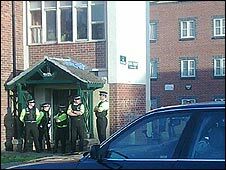 A bomb which exploded in Exeter was a mix of chemicals and nails, senior police sources have said. Police are waiting to question Nicky Reilly, 22, who is under guard being treated for severe facial lacerations following Thursday's explosion. They are said to have CCTV film showing the suspect boarding a bus from his Plymouth home carrying a rucksack. A bomb disposal team arrived at Mr Reilly's home in the Stonehouse area of Plymouth at lunchtime on Friday. In the hours following the explosion Deputy Chief Constable Tony Melville said police believed Mr Reilly had adopted the Islamic faith and had been "preyed upon" and "radicalised". However, Devon and Cornwall Police have not yet explained what they mean by "radicalised", nor to what extent Mr Reilly was "preyed upon". Police said Mr Reilly boarded a double-decker Stagecoach bus number X38 in Bretonside bus station, Plymouth, and have appealed to passengers on the service to contact them. "We know that between 1026 and 1040 yesterday morning 54 other passengers boarded the same bus and travelled to the main bus station in Paris Street, Exeter, arriving just after midday," a spokesman said. The bus made two scheduled stops at a garden centre on the A38 and at Ashburton en route to Exeter. Mr Reilly is described as white, 6ft 1in with short dark hair. He is heavily built, weighing approximately 18st (114kg). He was wearing blue jeans and a blue polo shirt with horizontal red and white stripes. 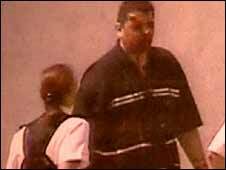 Neighbours of Mr Reilly have told BBC News he converted to Islam changed his name to Mohammed Rasheed. A team of about 20 specialists from Scotland Yard's Counter Terrorism branch SO15, has been brought in to help Devon and Cornwall Police with the investigation. It includes forensic officers, intelligence experts and detectives. After the arrest, police evacuated properties 40 miles away in the Stonehouse area of Plymouth. Officers from the Tactical Aid Group then searched a flat in King Street, Plymouth, where Reilly lived with his mother and brother. Mr Reilly, who police have said has a history of mental illness, was injured when a device detonated in the Giraffe restaurant at Princesshay shopping centre in Exeter at 1250 BST. CCTV footage taken from a nearby camera appears to show him emerging from the cafe with blood pouring down his face. Detectives said he suffered serious, but not life-threatening, injuries, and was unlikely to be well enough to be properly questioned until next week. No-one else was hurt in the explosion at the restaurant, which was busy at the time and is popular with families. Another device was found outside the premises and was made safe by bomb disposal experts. The explosion led to an evacuation of nearby buildings and the city's bus station about half a mile away. People were allowed to return at about 1900 BST. In a statement, Deputy Chief Constable Tony Melville said: "Our investigation so far indicates Reilly, who had a history of mental illness, had adopted the Islamic faith. "We believe, despite his weak and vulnerable illness, he was preyed upon, radicalised and taken advantage of." Syed Rahman, chairman of a Plymouth Islamic centre where Reilly once worshipped, told BBC News that those with a fundamentalist agenda were not welcome. He said: "We do not have and have never supported or condoned any radical or extremist behaviour. "This Islamic centre is only used for communal prayers." Omar Siddiqui, friend of Mr Reilly's and the president of the Islamic Society at the University of Plymouth, said he was stunned and amazed at what has been alleged. Mr Siddiqui said Plymouth's 3,500-strong Muslim community were moderate and he knew of no groups which would preach hate. People living near the Mr Reilly's Plymouth home, where he has lived with his family for many years, have described him as a "big friendly giant" who was "obsessed" with computers.